Patience is more than just a virtue; it’s a necessary creative measure. 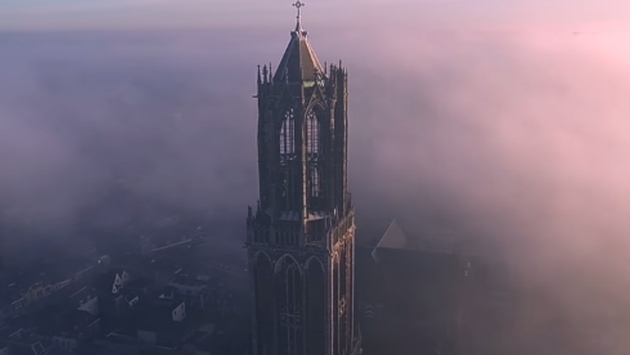 PetaPixel’s DL Cade (h/t Digg) spotted a stunning drone video from filmmakers Jelte Keur and Reinout van Schie, featuring the 14th century Dom Tower of Utrecht, which continues to be the tallest church tower in all of the Netherlands. What make this particular tower video stand out, besides the video, are the measures the filmmakers went to in order to capture true architectural beauty. Damn, Dom Tower. You look great for your age. Cade puts the tower at 370 feet above ground, which means you better have a drone if you are going to capture it from a pristine vantage. Of course, you simply can’t pump clouds in around the city, so you have to wait…and wait. The results, we think you will agree, were truly worth the tireless effort. What we get is something akin to cinematic grandeur, providing a tower that wouldn’t be out of place in some mystical fictional universe. Now if that piqued your interest you are in luck, because you can sate the intrigue with guided tours of the Dutch delight. It seems Dom Tower is a demanding landmark. Getting to the top takes hundreds of steps by stairwell and in upwards of 10 months by drone.